Toddler Activities with a simple tasks are a great way to reinforce concepts like colors or numbers. 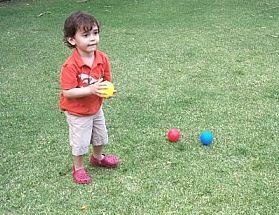 Using lightweight balls in simple games will engage any active toddler. Lay out three balls of different colors on your lawn. Instruct your child to find a certain color ball. Right or wrong answer, cheer your child on. Use encouraging language at all times. "Great job!" If a wrong color ball is brought to you, just reinforce the color he/she brought. "Oh that's a yellow ball, can you find the red ball?" 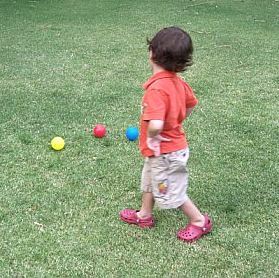 Lengthen the distance between you and the balls if your child enjoys running! 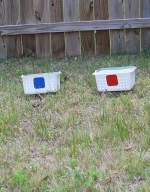 Label two or three small baskets with a color swatch using tape so you can change colors easily. (Piece of fabric, paint sample: see photo, printed from computer). Have your child match the ball with the corresponding basket. If your child enjoys this game you might use velcro tape so you can switch out the colors easier. Turn the baskets upside down with the ball underneath it. Have your child "find" the ball by looking at the color swatch on the basket. Have a laundry basket for your child to practice throwing the balls into after retrieving the correct color. If your child knows his/her colors incorporate some math concepts into these toddler activities by adding number concepts. Ask for two or three balls of a particular color. Or label baskets with numbers and have your child run to the balls, retrieve and put the correct number of balls into each basket. This will develop number recognition and understanding quantity. Line the balls up in a simple pattern and ask which ball goes next. Use patterns with two colors first and start with ABAB patterns and then add a third color ABCABC. More challenging patterns would be ABBCABBC. In addition to labelling the colors with a color swatch you can add the word. Print the color word in the corresponding color to build recognition and reinforce that letters have meaning.